From Wikipedia: "China has become the largest manufacturer of scooters producing over 50% of the worlds supply according to the MIC (Motorcycle Industry Council). With lower prices and better quality control China is now making scooters which meet strict United States DOT & EPA standards." These new Chinese scooters are a mixed bag. The quality varies widely and the makers, though high in business acumen, are notoriously low on business scruples and utterly abysmal when it comes to English communication. Some are, however, aware of the effect of this reputation and a few manufacturers of low-end scooters, notably TANK, Taizhou Chuanl, and Roadrunner are making a genuine effort to establish at least an appearance of respectability (see TANK Scooters). 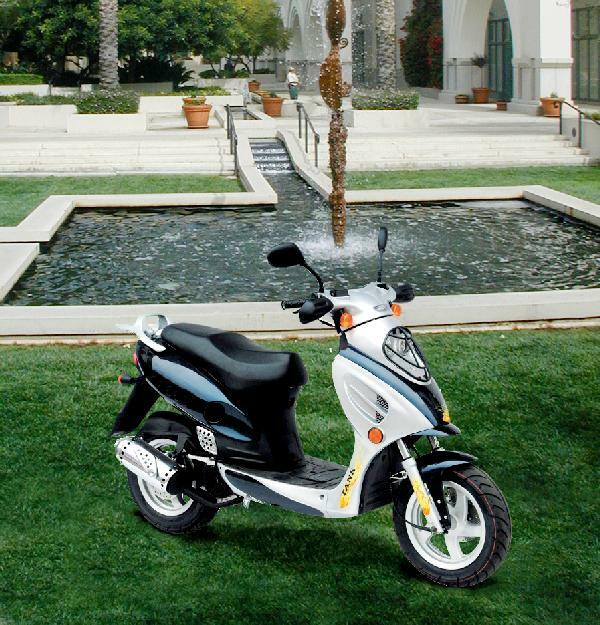 Taizhou Chuanl scooters, available from Global Trailer, have been around since 2002 and have had good reviews, and the New Roadrunner I-scooter line has a good quality/price ratio though only the 50cc models are currently approved for sale in California. Scooters from Chaunl from Global Trailer, however, do have California certification. (See California Legal Scooters). NB: Scooter World has published a well-researched article entitled "China and the American Scooterist" on the importation of Chinese scooters to America. The Chinese models do beat the prices of all scooter brands from Taiwan, Korea, Japan, and certainly Italy and the U.S. There have been accusations of, and unfair trade lawsuits filed against Chinese companies for "dumping" (selling below cost) scooters on the American market. Some are still not worth the price, particularly those which do not qualify for registration in the states, but in a certain sense, it is nice that the Chinese are (however unintentionally) subsidizing economical scooter usage in America. My TANK -- it has outlasted the manufacturer and the dealer. It is a good thing that Chinese scooters mix and match parts. See Chinese scooter parts. Yes, I did say "track record." Unlike so many other reverse engineered knock-off products produced in China, scooters have a longstanding history as a Chinese product. The gy6 engine used in Honda scooters has been manufactured in Chinese factories for decades. China runs on motorscooters. After the bicycle, motorscooters are the dominant form of private transportation. In China and Taiwan, one sometimes sees whole families on one scooter (See passengers on a scooter. ), sometimes dogs are on the scooter with their owner (See pets on scooters). The Chinese home market is vastly larger than the American or European markets and, for over a decade, Chinese products have dominated sales to developing countries. This does not mean that all Chinese factories know what they are doing. There is little regulation and quality products must be ferretted out. It is assumed that Chinese scooters are not as well made as those made in Korea, Taiwan, Japan and certainly the US and Europe -- scooters selling for twice to five-times the price, but that line has become unclear as many scooters contain parts originating in many different countries (See video). A closer look at OEMs -- by MRP. Some parts are definitely of lower quality, however -- stripped bolts and screws are more common than on Vespas for example says "(Scooterdoc)" Rich, who has worked on both. On the other hand, no scooter seems to exist that does not contain parts made in China (including Vespa, Piaggio, etc. ), and my experience with a TANK motorscooter (as well as input from others who ride them and other reputable Chinese brands) does not leave me wishing I had bought a machine costing four or five times as much. In fact, though I have ridden Hondas and Yamaha's extensively in the past, I have really enjoyed driving a TANK. 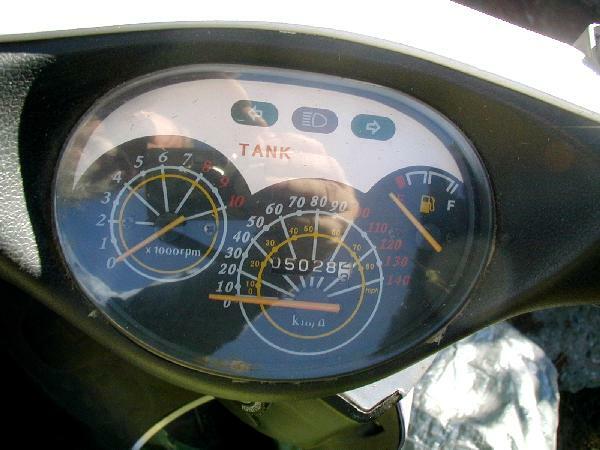 Of course, longevity is a different question, but ut at well over 8000 km now, after it has more than paid for itself in gas savings (See Motorscooter Return on Investment Calculator) and many times over in convenience and fun. And it seems that the longer I drive it, the better it runs. Though parts for Chinese scooters can be a bit of a problem, as mentioned elsewhere (See Motorscooter Replacement parts), but the Allpro Scooters dealership where I bought my TANK has always risen to the occasion and located the necessary parts and have managed to overcome problems caused by cheap parts, threads, etc. The engine and carburetor are of high quality (my carburetor is actually made in Japan). 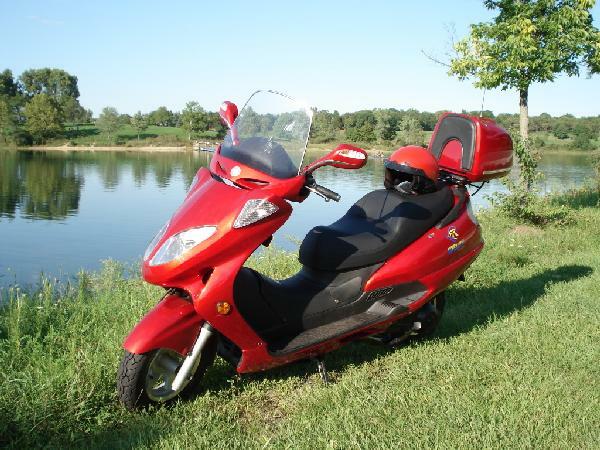 As Scooter Forum member, Dave, of Absolutely Scooters, Elgin, IL puts it: "Rice is Rice. Why pay twice the price???" Still not as well supported as the European and Japanese brands, Chinese scooter part support has made major strides. See Scooter Replacement Parts. One specific problem with many Chinese brands is that part usage is not always uniform even within one specific model. It is usually best to examine part images closely or, even better, to send a picture of the needed part when ordering online. The Chinese brands tend to cut corners wherever possible. Batteries and light bulbs, for example, are likely to be short lived. It is important to have a part supplier you can count on. Some brands of Chinese scooters are missing features required by various states. Specifically, some do not have a manual shut-off switch. It is also time-consuming and expensive to have models approved for sale in US states, particularly California (See Legislation-Happy California Shoots Itself in the Ecological Foot) which tend to make low-end scooters more expensive in California than they would otherwise be. 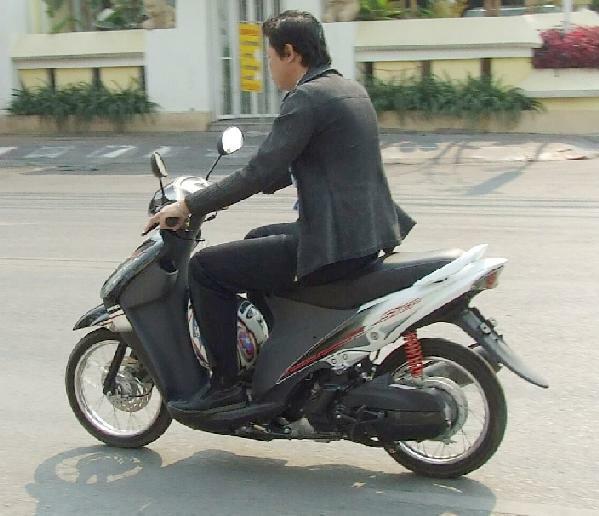 With the low capacity inferior chinese battery and an alarm system, the battery will run down on a scooter that does not see frequent use (See Motorscooter Batteries). A quick battery charge (and it is quick with an automotive battery charger) solves the problem. A kick start and a few turns around the block will not always revive a flat battery, so it is wise (but not necessarily easy) to learn to use the kick starter (see Motorscooter Kick Starters). If only it were possible to turn off the headlight when starting with a dead battery (the always-on feature is legally mandated for motorcycles in some states See State Regulations), it would be much easier. Ideally, one would want a charging system that uses power generated from braking. A solar charger may also work. We are experimenting. Solution: a simple automatic battery charger and maintainer. See our Essential Scooter Kit. Where scooters dominate, scooting in a suit is perfectly suitable. Though quality control and business policy have attained reputable levels, not one Chinese company has, to my knowledge, seen the value in providing readable owner's and repair manuals. They seem not only incapable of producing readable English, but are also apparently oblivious of the fact that well written documentation would make a major contribution to their reputation. Hiring a literate college student to translate their literature, labeling, and packaging from fourth-grade pidgin English into clear and error-free professional language does not require a major investment, and it would make an enormous difference to product and company image. However, this is seldom, if ever, done with even the best Chinese products which remain very poorly documented (see a PDF of the TANK Sporty manual). A general scooter repair manual covering a wide range of twist-and-go scooters is available, however, which will certainly apply to Chinese scooters copying the fundamental design. It is certainly better than nothing (see Scooter Repair). Certain dedicated American dealers have risen to the task of filling this information void: A set of manuals for TANK has been produced by Allpro Scooters in Ontario, California (a compelling incentive to buy from them) but has not been published for reasons involving legality and human nature. A complete manual set is reputedly being written in American English for Baron models by bigassmotors.com. A fairly good English translation of the pidgin English TANK Touring Duluxe manual is available -- by Russell C. Huff in Taiwan. Roadrunner USA, which oversees the manufacture of its scooters in China, does support its products in quality American English. Many Chinese scooters come with a very nice alarm system with remote. In some cases the remote can also be used to start the scooter motor remotely. 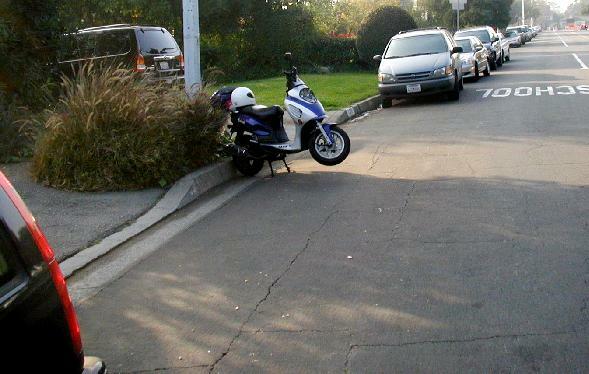 However, in the absence of a good manual, many Chinese scooter owners find it easier not to use the alarm at all. It's a bit tricky to turn the alarm off and the sensor is so sensitive that a bit of wind or falling leaves will keep the scooter chirping regularly through the night (and, of course, running the battery down in the process). Working on the scooter, cleaning, fastening cargo etc., becomes a noisy and irritating process until one discovers the secrets to turning off and adjusting the sensitivity level of the alarm. These issues are demystified in our Chinese Scooter Alarms page. They are cheap! No question about it. They do not tend to have design flaws since the designs copied by the Chinese have been time-tested elsewhere. They tend to have some strange parts and weaknesses (See Left-handed Motorscooters), but if you can do some basic troubleshooting, or know someone who can, they can be perfectly servicable vehicles -- and they look great.